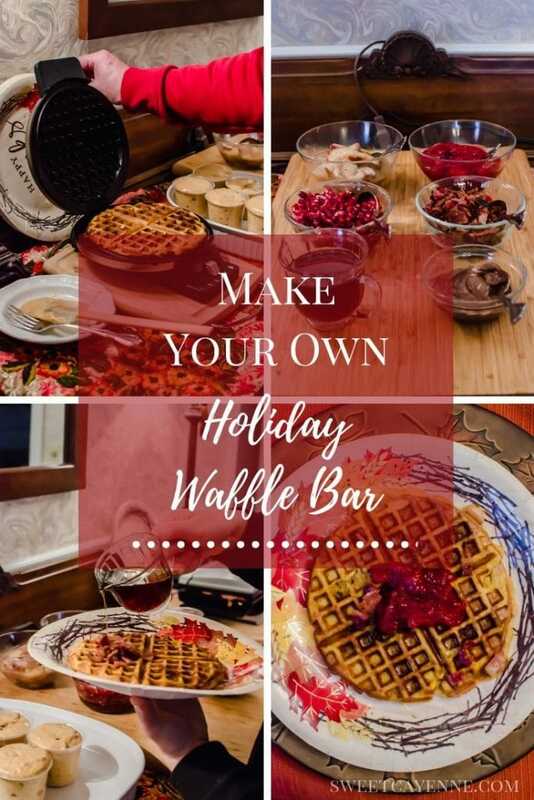 This is holiday waffle bar guide is super festive, merry, make-ahead menu to serve on Christmas morning or as part of a holiday brunch! Christmas morning breakfast is one of my favorite meals of the year. While we don’t have a traditional meal that we stick to in our family, the food we have on Christmas morning is always extra special and super tasty! Some years we have cinnamon rolls, some years it’s monkey bread, or sometimes we have biscuits and chocolate gravy. It just depends on what we are in the mood for! 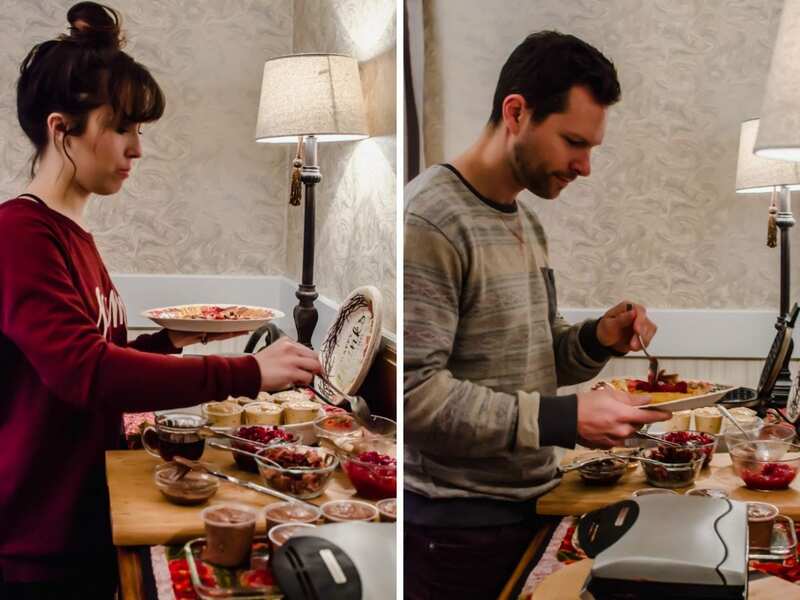 This year, I wanted to come up with a Christmas morning breakfast menu that could be made the day before and easily assembled the next morning. I think it’s always fun to have a “make your own” buffet where everyone gets to customize their breakfast. 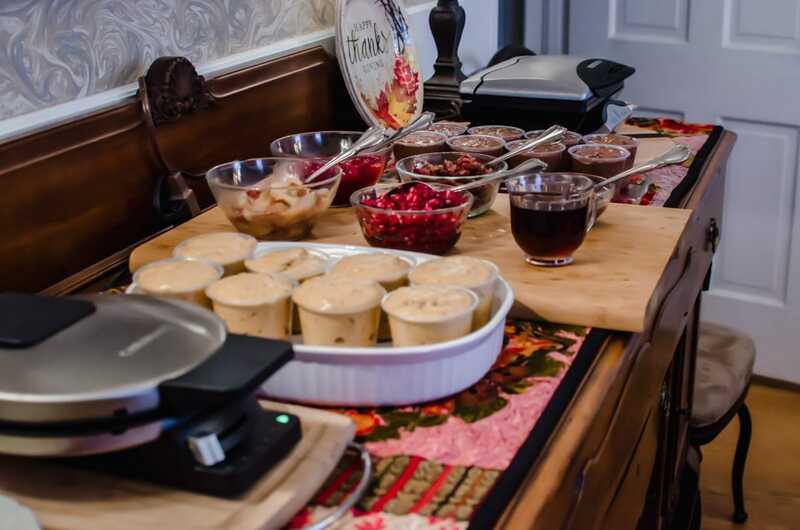 I loved the Holiday Pancake Bar with eggnog and gingerbread pancakes I did a few years ago, but I wanted an option for something I wouldn’t have to cook and could just chill with the rest of my family. 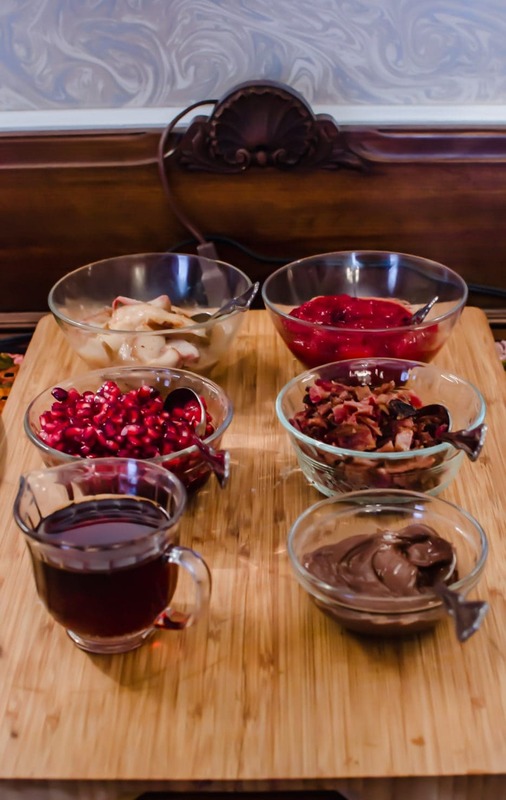 Enter the holiday waffle bar! 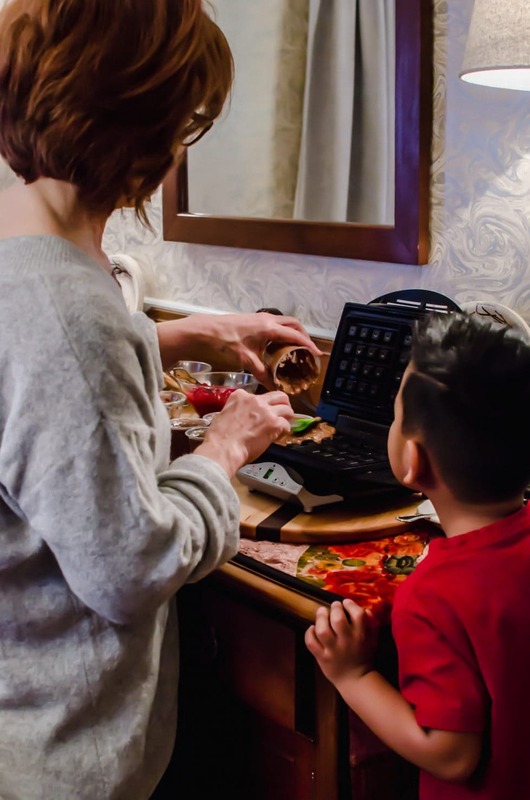 Everyone had so much fun making their waffles! It was nice to just take pictures of everyone making their waffle and putting their own unique combo of toppings on it. And I loved that mom and I weren’t tied to a hot stove in order to get breakfast on the table! The whole process was super chill, and once everyone had been through the waffle bar once, some went again to try the other flavor. I’m thinking this will become more of a tradition because we all enjoyed it so much! 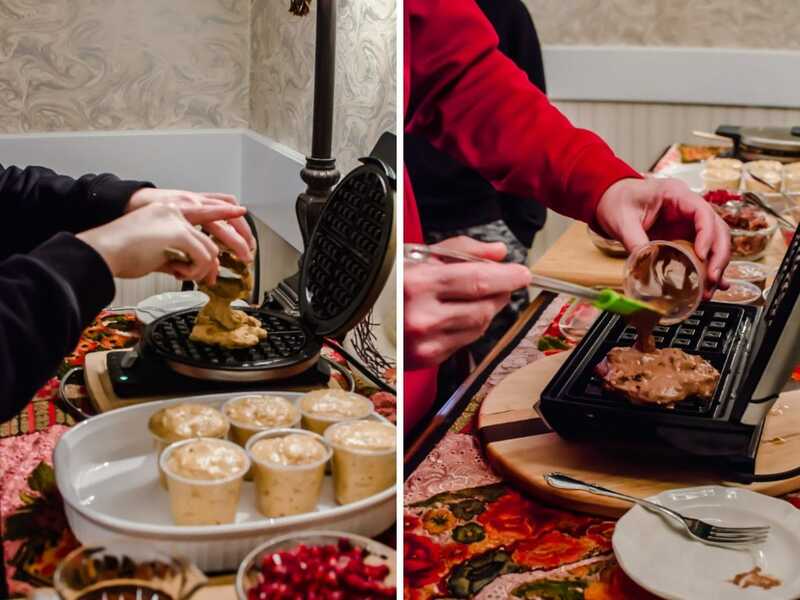 Are you ready to try this Make-Ahead Holiday Waffle Bar? I’m so excited for you to try this recipe. Once you get the chance to make it, please let me know how it turns out for you! Leave a comment and rate the recipe below. This will help me with the creation of future recipes! I’d also love to feature your creation in my monthly newsletter, so you can upload a photo to Instagram or Twitter with the tag @sweetcayenne5 to be featured! 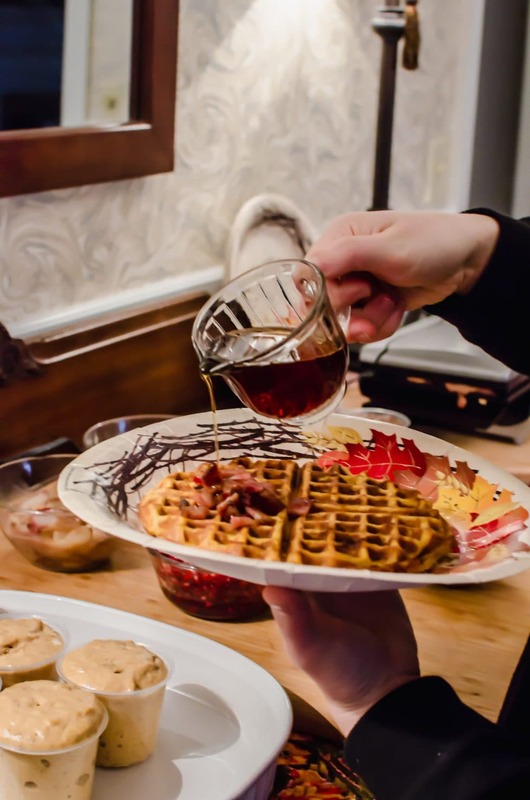 This holiday waffle bar menu is a festive, make-ahead breakfast option that your guests can customize as they make a waffle! Pumpkin waffle recipe adapted from Two Peas and Their Pod. Place butter in a small saucepan over medium heat. When the stick has melted, whisk the butter over the heat until small brown bits form at the bottom and the melted butter has a nutty fragrance. Be sure to whisk constantly so that the milk solids in the butter do not burn as they are browning. Transfer the brown butter to a bowl to cool to room temperature. In a large bowl, combine the flour, brown sugar, baking powder and soda, salt, and spices by stirring together with a whisk. In a separate bowl, whisk together the eggs, buttermilk, vanilla, pumpkin, and cooled brown butter. Add the wet ingredients to the dry and whisk together just until combined. Use a rubber spatula to fold in any residual flour on the sides of bowl. 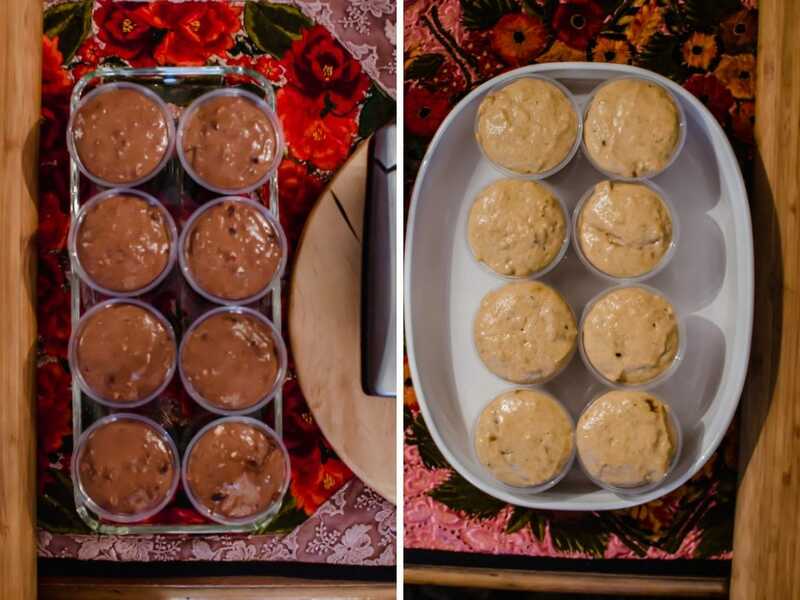 Divide the batter into small plastic cups, placing about ¾ cup of batter in each. Cover and refrigerate overnight. In a large bowl, whisk together the flour, cocoa powder, brown sugar, baking powder, baking soda, and salt in a large bowl. Make a well in the center and add egg yolks, buttermilk, butter, and vanilla. Use a fork to blend together in the well, then gradually incorporate dry ingredients, mixing just until combined. Using an electric mixer on medium-high speed, beat egg whites in a small bowl until soft peaks form. Gently fold in the egg whites, then fold in the white chocolate and cranberries. Divide the batter into small plastic cups, placing about ¾ cup of batter in each. Cover and refrigerate overnight. Spray two waffles with cooking spray and place them on your buffet table. Preheat the waffle irons. 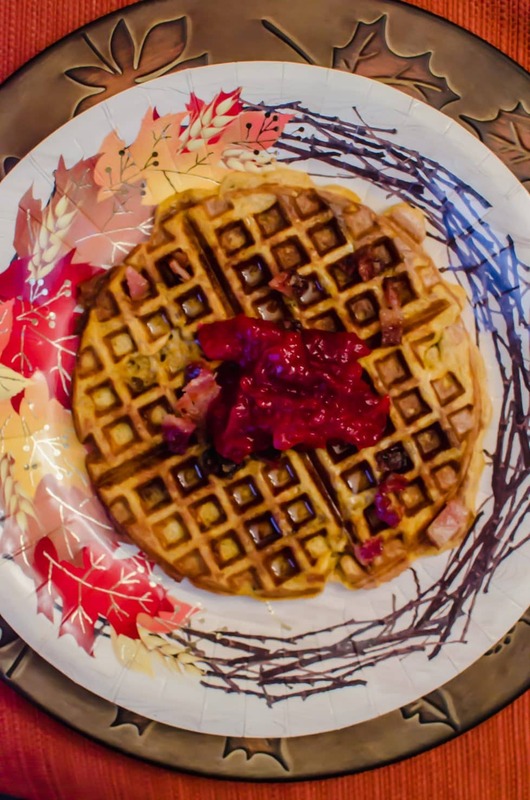 Put a small plate with a rubber spatula and fork next to each waffle iron. Place trays of the two batters in cups next to each waffle iron. Place out bowls with the various toppings. Use the rubber spatula to spread one cup of batter per waffle iron, and cook until desired doneness is reached. Use the fork to remove the waffle from the iron onto a plate. Tops as desired! For the bacon pieces: I like to bake my bacon on a sheet pan covered with parchment at 375 degrees F. Bake for 10 minutes, flip the bacon over and drain the grease from pan, sprinkle the bacon with a little brown sugar, then bake an additional 8-12 minutes until desired doneness is reached. Cool and chop into pieces for the waffle bar. For the cinnamon pears: slice 2 pears into thin pieces. Saute in 1 tablespoon of butter over medium-low heat for about 5 minutes or until slightly softened. Add some sprinkles of cinnamon, toss to combine, and serve warm.